Click a tree to get started! 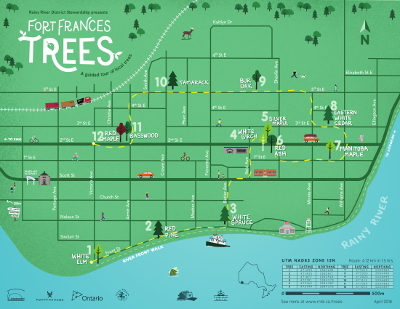 The Fort Frances Trees map brings Fort Frances' urban forest to your fingertips. 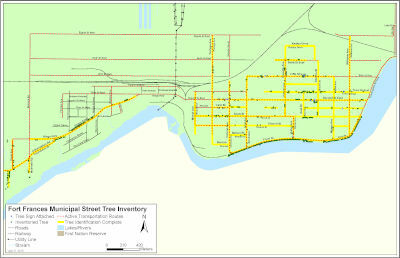 For the first time, you have access to information about public street trees in Fort Frances. Learn about the trees that make up our town’s urban forest, pick your favourite trees and share them with your friends! Benefits and values are calculated using a model provided by the U.S. Forest Service. Learn more about the benefits of trees to Fort Frances. A functional value provided by the trees. This is the monetary value associated with tree effects on atmospheric carbon. This value is estimated based on the economic damages associated with increases in carbon or carbon dioxide emissions. Based on the U.S. Social Cost of Carbon. Calculated using the price of $0.11487 per kilogram. A functional value provided by the trees. This is the monetary value of stormwater runoff that is avoided because of rainfall interception by trees. This value is estimated based on the economic damages associated with runoff and costs of stormwater control. Based on the U.S. national average cost of stormwater control. Calculated using the price of $2.325/m3. A functional value provided by the trees. Energy Use: The monetary value of increased or decreased energy costs as a result of a tree’s effect on residential building energy use. Emissions: The monetary value of increases or decreases in carbon emissions from power plants as a result of changes in energy use. This value is estimated based on the economic damages associated with increases in carbon or carbon dioxide emissions. Trees less than 3m tall or further than 18m away from buildings do not provide calculable energy benefits to nearby buildings. Calculated using the prices of $0.075 per kWh and $10.45 per MBTU. A functional value provided by the trees. This is the monetary value associated with tree effects on atmospheric pollution. This value is estimated based on the economic damages associated with increases in pollution emissions and/or the impact of air pollution on human health. Based on U.S. median externality values for carbon monoxide, nitrogen dioxide, sulfur dioxide, particulate matter less than 2.5 microns, and ozone removal. Benefits were calculated based on a reported 85.0 centimeters of total annual precipitation in 2010. All prices are displayed in CAD, but were generated in USD. The exchange rate used was 1.28 CAD = 1.00 USD in November of 2017.